At the end of the last ice age, a population of polar bears was stranded by the receding ice on a few islands in southeastern Alaska. Male brown bears swam across to the islands from the Alaskan mainland and mated with female polar bears, eventually transforming the polar bear population into brown bears. Evidence for this surprising scenario emerged from a new genetic study of polar bears and brown bears led by researchers at the University of California, Santa Cruz. The findings, published March 14 in PLOS Genetics, upend prevailing ideas about the evolutionary history of the two species, which are closely related and known to produce fertile hybrids. Previous studies suggested that past hybridization had resulted in all polar bears having genes that came from brown bears. But the new study indicates that episodes of gene flow between the two species occurred only in isolated populations and did not affect the larger polar bear population, which remains free of brown bear genes. 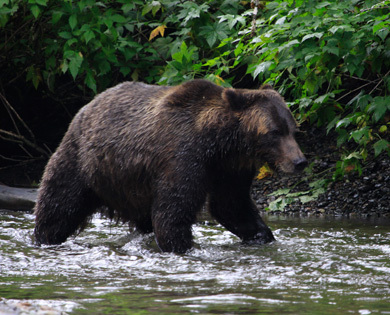 At the center of the confusion is a population of brown bears that live on Alaska's Admiralty, Baranof, and Chicagof Islands, known as the ABC Islands. These bears--clearly brown bears in appearance and behavior--have striking genetic similarities to polar bears. "This population of brown bears stood out as being really weird genetically, and there's been a long controversy about their relationship to polar bears. We can now explain it, and instead of the convoluted history some have proposed, it's a very simple story," said coauthor Beth Shapiro, associate professor of ecology and evolutionary biology at UC Santa Cruz. Shapiro and her colleagues analyzed genome-wide DNA sequence data from seven polar bears, an ABC Islands brown bear, a mainland Alaskan brown bear, and a black bear. The study also included genetic data from other bears that was recently published by other researchers. Shapiro's team found that polar bears are a remarkably homogeneous species with no evidence of brown bear ancestry, whereas the ABC Islands brown bears show clear evidence of polar bear ancestry. A key finding is that the polar bear ancestry of ABC Islands brown bears is conspicuously enriched in the maternally inherited X chromosome. About 6.5 percent of the X chromosomes of the ABC Islands bears came recently from polar bears, compared to about 1 percent of the rest of their genome. This means that the ABC Islands brown bears share more DNA with polar bear females than they do with polar bear males, Shapiro said. To understand how hybridization could lead to this unexpected result, the team ran simulations of various demographic scenarios. "Of all the models we tested, the best supported was the scenario in which male brown bears wandered onto the islands and gradually transformed the population from polar bears into brown bears," said first author James Cahill, a graduate student in ecology and evolutionary biology at UC Santa Cruz. This scenario is consistent with the known behavior of brown bears and polar bears, according to coauthor Ian Stirling, a biologist at the University of Alberta in Edmonton, Canada. Mixing of polar bears and brown bears is seen today in the Canadian Beaufort Sea, where adult male brown bears wander onto the remaining sea ice in late spring and sometimes mate with female polar bears, he said. In areas such as western Hudson Bay and the Russian coast, polar bears are spending more time on land in response to climate warming and loss of sea ice, a behavior that could have left polar bears stranded on the ABC Islands at the end of the last ice age. Young male brown bears tend to leave the area where they were born in search of new territory. They may well have dispersed across the water from the Alaskan mainland to the ABC Islands and hybridized with polar bears stranded there when the sea ice disappeared. "The combination of genetics and the known behavior of brown and polar bears hybridizing in the wild today tells us how the ABC Islands bears came to be: they are the descendants of many male brown bear immigrants and some female polar bears from long ago," Stirling said. The findings suggest that continued climate warming and loss of arctic sea ice may lead to the same thing happening more broadly, said coauthor Richard E. (Ed) Green, an assistant professor of biomolecular engineering in UCSC's Baskin School of Engineering. "As the ice melts in the Arctic, what is going to happen to the polar bears? In the ABC Islands, the polar bears are gone. They're brown bears now, but with polar bear genes still present in their genomes," he said. The first genetic studies of ABC Islands brown bears looked at their mitochondrial DNA, which is separate from the chromosomes and is inherited only through the female lineage. The mitochondrial DNA of ABC Islands brown bears matches that of polar bears more closely than that of other brown bears, which led some scientists to think that the ABC Islands brown bears gave rise to modern polar bears. The new study looks at the "nuclear DNA" carried on the chromosomes in the cell nucleus. It is the latest in a series of genetic studies of polar bears published in recent years, each of which has prompted new ideas about the relationship between polar bears and brown bears. A 2010 study of fossils and mitochondrial DNA supported the idea that polar bears evolved from the ABC Islands brown bears. But a 2011 study of mitochondrial DNA from extinct Irish brown bears showed an even closer match to polar bears and suggested that polar bears got their mitochondrial DNA from hybridization with Irish bears. Shapiro, a coauthor of that study, said she now thinks the Irish brown bears may be another example of what happened in the ABC Islands, but she can't say for sure until she studies their nuclear DNA. "In retrospect, I think we were wrong about the directionality of the gene flow between polar bears and Irish brown bears," she said. Two studies published in 2012 sought to determine when the polar bear lineage diverged from the brown bear lineage using nuclear DNA data. The first, published in April in Science, put the split at 600,000 years ago and concluded that polar bears carry brown bear mitochondrial DNA due to past hybridizations. The second, published in July in Proceedings of the National Academy of Sciences, suggested that brown bears, black bears, and polar bears diverged around 4 to 5 million years ago, followed by repeated episodes of hybridization between polar bears and brown bears. The new study does not address the question of how long ago polar bears diverged from brown bears, but it may help sort out the conflicting results of recent studies. "It's a good step in the right direction of understanding what really happened," Shapiro said. The study does indicate that the divergence of polar bears from brown bears was only half as long ago as the split between the brown bear and black bear lineages, said Cahill. "We can tell how long brown bears and polar bears have been separate species as a proportion of how long ago they separated from more distantly related species, but putting a year on it is very difficult," he said. 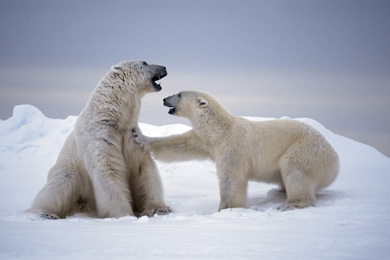 Green noted that efforts to understand the relationship between polar bears and brown bears has been complicated by the unusual case of the ABC Islands brown bears. "It's as if you were studying the relationship between humans and chimpanzees and your analysis included DNA from some weird population of humans that had hybridized with chimps. You would get very strange results until you figured that out," he said. In addition to Cahill, Green, Shapiro, and Stirling, the coauthors of the new paper include postdoctoral researchers Tara Fulton and Mathias Stiller, undergraduate Rauf Salamzade, and graduate student John St. John at UC Santa Cruz; Flora Jay and Montgomery Slatkin at UC Berkeley; and Nikita Ovsyanikov at the Wrangel Island State Nature Reserve in Russia. Green and Shapiro direct the UCSC Paleogenomics Lab. This research was funded by the Searle Scholars Program.